Dacia launched in Romania the new Duster, the first SUV in the history of the group, just two weeks after its official debut in the Geneva Motor Show. During the event held in Bucharest, Fabrice Cambolive, the commercial director of Dacia, said that the Romanian model has aroused a particular interest among the local public. 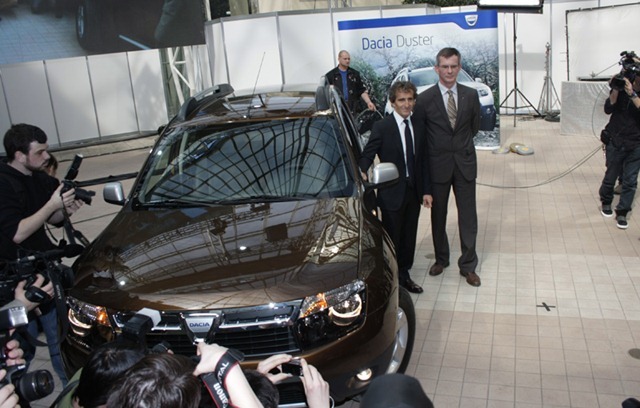 The orders for the new Duster exploded but the surprise for the Dacia officials was the large number of Romanians that chose the higher level of equipment. According to Cambolive, 80% of the clients who ordered Dacia Duster opted for the top version Laureate, at a price around 15.000 euros. Fabrice Cambolive also said that half of the clients who ordered Duster opted for the 4×4 version, 20% opted for the optional package that includes leather and 40% opted for the brown nut color. How/Where can I buy a DACIA DUSTER in Canada? I would replace immediately my Kia with a Dacia. I think that this model would “break” the North American SUV market. It might be “Nissan” written on a corner of my car but I would insist to see “DACIA” on it. Please keep “DACIA” emblem on the car! Bring DACIA in Canada!